I have seen my fair share of bad Arabic tattoo translations. But, in recent weeks one of them has especially caught my eye. The Arabic phrase انا معفن ana mu3affan is purported to mean “I appreciate life” whereas it actually means “I am rotten” or “I am putrid”. The trouble is that many people keep reposting, reblogging and retweeting the bad translation, thereby making it seem that the majority of users agree that this is the correct translation. It’s a shame really to think that someone has got these bad words inked on their skin when all they wanted was something encouraging. That’s why I’ve decided to write a blog post about the real translation of “appreciate life”. This would be the imperative of “to appreciate”, i.e. “appreciate life!”. However, the verb qaddara can also mean to assess or evaluate (i.e. appraising the worth or value of something). In addition, the phrase could also mean “he valued life”, as the written language does not make a difference between the imperative form and the third person singular past tense form (on the other hand there is a difference in pronunciation, but this is not reflected in writing). This way it’s clear that it’s qaddir (imperative) and not qaddara (3rd person singular past tense). i3zaaz means “love, affection, regard or esteem for something”, so the translation would be “esteem for life” or “having a high regard for life”. The word can also mean “strenghtening, reinforcing, or endearing”. 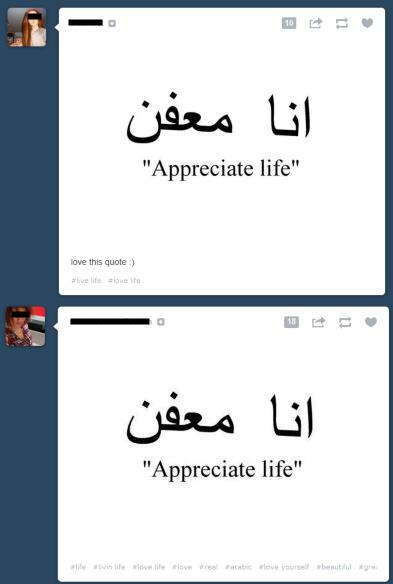 I hope this blog post helps someone find a good translation of “appreciate life” for their Arabic tattoo. 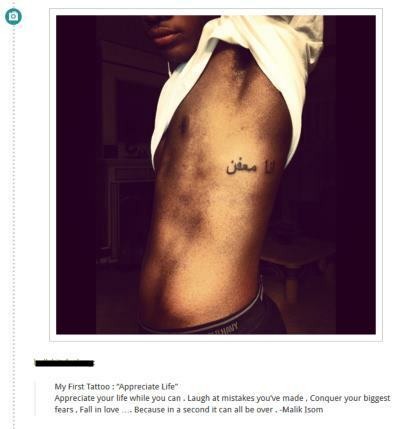 This entry was posted in Tattoos and tagged appreciate life, arabic tattoo, designs, esteem, mistakes, value by ArabicGenie. Bookmark the permalink. Hi, I was just wondering what “faith” and “warrior” would be, and is it correct that it is a translation of “Iman” and “Imari”? Thankyou for taking the time out to answer my question, thanks again! “Faith” is الإيمان (al-imaan), while warrior is المقاتل (al-muqaatil). There are designs for both of these words in my Arabic Tattoos ebook. To be honest, I can’t think of any Arabic words from which the name ‘Imari’ might have been derived, so perhaps the name is not of Arabic origin? I want to have a tattoo in Arabic, and every person that I asked for translation gave me different writings, can you translate the words “Desert rose” and “Rebel” in Arabic hand writing for me? Thank you. Hi there! This isn’t Arabic. I have a rough translation but I want to get it bang on. I’m interested in getting ‘appreciate life’ tattooed on me and I’ve seen that you’ve translated it. I’ve put it into an Arabic – English translator and your translation has come out as ‘as life’ is this a mistake by the translator(most likely) is yours definitely correct? forgive me if it is, I just want to make sure! this is the translation in question. Hi! Please can you translate ‘Daddy’s little girl’ into arabic for me! Really want to get it tattooed, also how would you write ‘Mohammed Ebrahim’ in Arabic calligraphy? If you can dream id you can do it. how do you translate the word “open” in arabic? it is a bit hard to say daddy’s little girl, you can say daddy’s princess اميرة ابي.another thing is دلوعة بابا i don’t know how to translate that exactly but we use it as in daddy’s little girl.. دلوعة might be translated as spoiled perhaps indulged. regret nothing, لا اندم علي شئ that is more likely i regret nothing. After seeing the comments above, I have to say that you need to be very careful picking the right translation, ’cause some of Arabs here did well in translating your requests, but there are horrible writing mistakes!!! Don’t know, but Ms. Nadia then Mr. Abdullah were the best. I can’t give you the right translation of others, but I can tell you that mostly there are unforgivable mistakes 🙁 don’t make them into tattoos before making sure. There’s another point I’d like to mention. Yeah, when you ask a translation they may differ from a person to another. If whom you asked have enough knowledge in Arabic, then you need not to worry, but to cheer up. There are many formations for the single expression and they all can be right, pick what sounds beautiful for you. Besides, you better ask your translator about all the details of his translation, ’cause Arabic grammar is very specific. You might get an expression that so far than what you were looking to! Simply because he/she doesn’t get what “exactly” you meant. One last thing >< You better mention if you want the translation in slang or classical language .. They reeeaally DIFFER O_O watch out! could anyone translate my name Kira in arabic? How would you say:”you (she) will never be forgotten”? Anyone can translate in arabic to me the words “brightness of the stars” or “shining of the stars”… Or “Be shiny”. Quick question is this translated correctly? What is live for yourself in Arabic? Hello, what is “free your mind” translated to? Is it like the one pinterest has up?thanks! Hi. I got the wrong translation for appreciate life tattooed on me. Is there some other phrase I can use to cover this up that doesn’t mean ” I’m rotten”? I found out 3 years ago that it’s wrong. But I really want to change it. Any advice? Hey! I am so glad I found this. Would you be able to translate “Equestrian” for me? I found a few different translation, but I believe it’s how you are using it in a sentence. 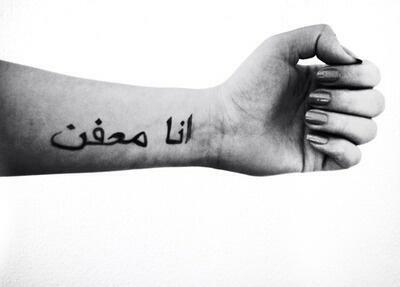 Can anyone here help me translate “If it’s meant to be, it will be” in arabic? I am trying to get the correct translation for tattoo. Hey, anyone stupid enough to Mar their body with the language of terrorist scum deserves what they get.